Is there evidence of intelligent life on Mars? Other than our unfortunate probes, that is. 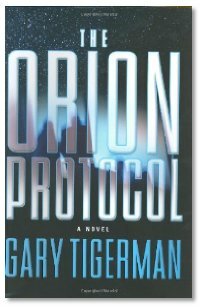 That's the topic of discussion in Gary's new novel, The Orion Protocol. Government corruption, espionagel, intrigue... all are part of thriller novel with a science fiction element. And maybe, just maybe, it might be true. Hey, what can we say: we're topical. Not sure what got into us, but with all the attention on the Mars missions and their relative successes, we thought we'd keep on talking about brine and magic carpet. Care to join us? Shooting mice into space for fun and science! Mike doesn't like Scooby snacks. Wonders why others do. Feeds adult humor in kids stuff.